The UC Cooperative Extension conducted a two-year study comparing the performance of conventional horizontal-blowing wind machine relative to the more recently developed upward-blowing type of wind machines. The purpose of this project was to develop quantitative information regarding how the different types of wind machines were able to alter vineyard temperatures on frost nights. A considerable amount of historical evaluation information exists for conventional wind machines, but very little independent research information is available regarding the performance of the upward-blowing wind machines. 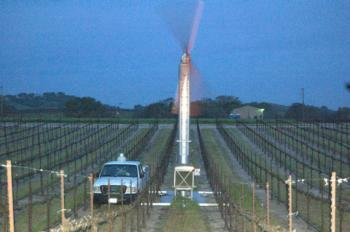 Tests were conducted in a Paso Robles area vineyard during the 2010 and 2011 spring seasons.